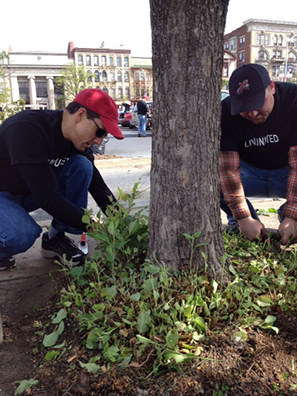 For the past two years, ZINN has organized a Earth Day community cleanup event in downtown Lebanon. The event organized volunteers to clean up city blocks in the downtown district with hopes of making a positive difference while instilling pride in our hometown community. The event has been both successful and significant, and grew in participation to over 120 volunteers in just two years. In an effort to broaden the reach of the project, we are joining our initiative with United Way’s Day of Caring, along with co-sponsor Lebanon Federal Credit Union. Our hope is that by combining with the United Way’s efforts we can engage more people and have a bigger impact into a bigger area of Lebanon County. The event is scheduled for Saturday, April 28th between 9:00 AM and noon and will include various cleanup and improvement projects throughout Lebanon and surrounding communities. We invite you to organize a team and be part of this effort to make a positive difference in our community. To register go to www.unitedwaylebco.org.